This is an old link, but there were at least 2 of these events.....2013 and 2014. Anyone know anything about this? I don't recall anyone discussing it on here. Seems small/local to the Birmingham area. Yeah, I never heard anybody mention either. Maybe Bruce will chime in. He's from Alabama. I wonder what the yellow stuff in the cup is? Beer or polluted water....same thing? Depends; are we talking Ten Fiddy (proper beer), or Natty Lite (watered-down fish pee)? At any rate, I like the realistic-yet-still-arty darter on the ad. Yeah, I usually do the watered down fish urine that most call Natty Light. I suspect "Ten Fiddy" is 10.5%? That's a bit too much for my tastes, though I can drink the occasional IPA as long as it has a cool name and label. I collect fish named craft beers. Really love that Sculpin IPA. The beer is okay, but the packaging is what sold me. "Yes. It is a nicely drawn darter and a festival that no one knows of. Some people like light beer. Some people like heavy beer." If it eventually makes your face tingle---whether it takes 27 or 5, it's doing its job. So aside from a festival named after a fish most of us have at the top of our lists, does anyone know anything about the specific fish itself that the festival is held for? It looks like "no" Nick. I love it though. May have been very small and not super successful? Found this on Google, so it must be true. If there is a 2016 edition (looks like there's been three so far) this is right up NANFA's alley. Something to consider being a part of? Years ago several NANFA members converged in Birmingham at Stott Noble's home. I recall Stephen Ellis, Dave Nelly and maybe Ranger Bob attending. I wrote a report about it, back in the pre-forum days on the old NANFA list. Text only. Maybe someone could track it down. We had a good time in the field 2 days, stayed up late talking fish. We grilled wild mushrooms and Stott smoked his Beer Can Chicken. I slept on the stubby couch with cats running up and down me all night. I snorkeled with the Vermillions, a spring run access, thick vegetation, big creek alongside and low rustic railroad bridge. CFI was going to work with the Vermillions but last minute regulations got involved. Current CFI status unknown. We seined up Watercress Darters at a park site but the creek was very gnarrly with culverts and rubbled trash. We dipnetted Rush Darters from a disturbing commercial urban site next to culverts, gravel parking lots and cluttered trash. Amazing that this site is for a lone specie. This was pre-camera days. We were just out exploring new waters. A NANFA BoD member fussed at us afterwards but Dave had permits so we could legally catch and view the little fellers. The habitats were all very urban. As for the DarterFest it would be fun to attend but i do not think Stott is active anymore. Bruce is 2 hours north in Huntsville. And unless they have a parade with the 3 Darter species as floating fishes i doubt i could be lured to B'Ham just for the beer. Nice city though. A fine garden and Vulcan overlooks much of downtown. Love the poster and always like to see pretty belly dancers... if any of you bothered to look at the TV link report. The festival did not seem too darter like but surely there are some nice exhibits. What would be cool is to organize an outing on that same weekend at the next DarterFest. Sounds like a job for an Alabamian fishy representative. Edited by Casper, 02 November 2015 - 06:41 PM. And I thought I heard from Stott on the NANFA facebook or something not too long ago... but you are right, he is not active with NANFA much anymore. Casper, thanks for the summary and write-up. And thanks, Michael, for finding it. I was a bit wrong... there are a few interesting accounts and perspectives on the NANFA rep site for Bama. Pictures included. Stephen Ellis had compiled an account with photos. 2002. Lots of time for memories to fade. Fishhead Ellis was a good active NANFA member for a number of years. I think his life has taken him in other directions since. I certainly miss his participation. He was a good writer and travel buddy to share fishy stories. Here is one link. Four more offer other trip accounts. 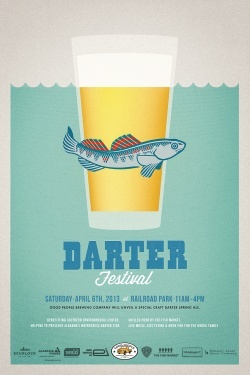 I would think the Darter Festival poster features an artistic melding of all 3 species. I would assume there are plenty of true photographic images for each on the net for those inclined to Google. We use to Alabama camp on the Little Sipsey near Double Springs. Those were fun adventures. And then Bruce hosted the NANFA AL event in 2003 or so. People fussed at me for putting a dead fish on the back of the convention shirt. I thought about stapling a live one. It actually was a cool X-Ray of the extinct Whiteline Topminnow. Might be a variant of the Barrens Topminnow. We use to Alabama camp on the Little Sipsey near Double Springs. Those were fun adventures. I don't want to totally change the subject, but that is a very cool location. A tease and a bit of motivation. I miss those active SE wandering days. President Bruce and the Stott could provide remedy. I think we got fussed at by AL lurkering authorites on a last organizational attempt. I just wanna swim with the fishes... maybe cook an unfortunate Redhorse streamside. If i recall you were the last to visit on your way to camping along the Buffalo.